In December 2016, we were out at dinner with my family when Mom and Dad announced that it was time to choose the destination for our 2018 family vacation to celebrate Kevin and Kelsey's graduations. I think we all had the same thought at the same time: Hawaii! Turns out Dad was thinking the same thing. Thirty years ago, Dad's parents took their family to Hawaii, and Dad was hoping to do the same for us! So, on the morning of May 26th, all 8 adults and 3 kids packed up and headed to the airport. The kids were troopers on such a long day of travel. Thank goodness our plane had in-flight entertainment showing both "Moana" and "Coco," which Mae watched on repeat. 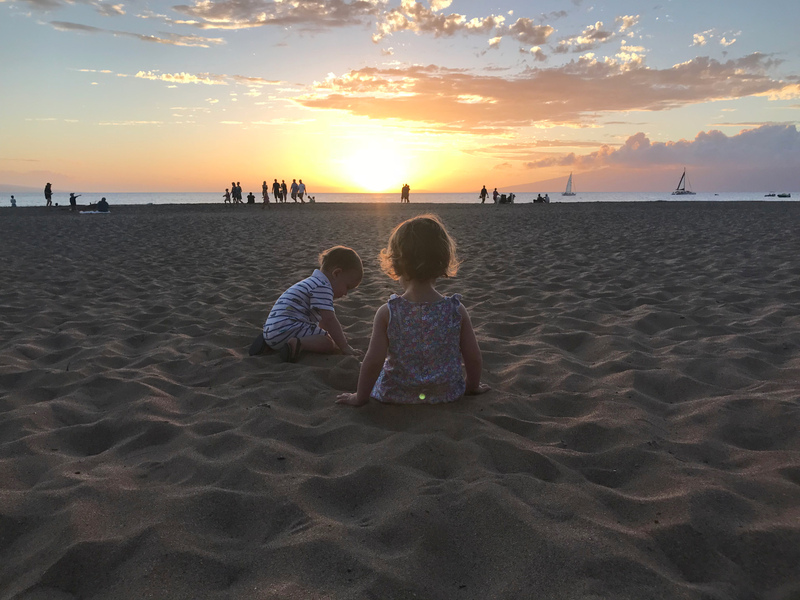 We arrived in Maui around 2 p.m., picked up our 2 rental vans, and drove to the west side of the island for check-in at our resort, the Ka'anapali Ali'i. My memories of the first day are clouded by a sleep-deprived haze, but I remember a beautiful beachy sunset, the best fish tacos I've ever eaten, and the first of many mai tais throughout the week. By the time we went to bed, we had been up for about 22 hours. Sunday morning, we woke up to the sound of Mae rustling around in her pack 'n play. I asked, "Mae, do you remember where you are??" and she responded, "Hawaii!" (We had been talking up this trip for weeks as a visit to "Moana Beach.") We took it easy all day with a trip into the town of Lahaina for church, lunch, and grocery shopping, followed by an afternoon at the pool. 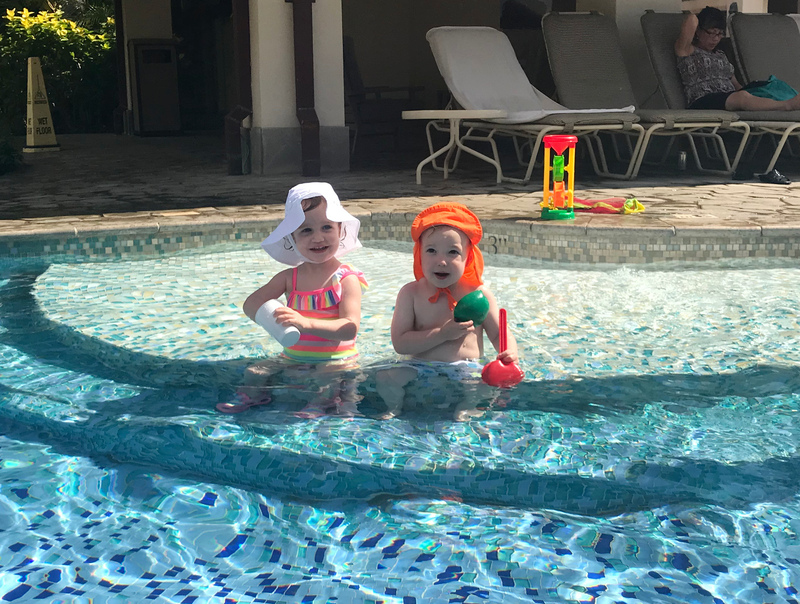 The resort had a great baby pool area, which Oliver and Mae loved. Mae unintentionally submerged a few times after tripping over the vents in the pool floor. We applauded her "swimming" as I scooped her up, and she was both proud of- and traumatized by- the experience. Monday morning, Mae woke us up early, cheerfully announcing, "I napped!" We gathered everyone up and headed out for a snorkeling tour of Molokini Crater. We took turns snorkeling and watching kids on the boat. Dan and I saw all sorts of neat things including sea urchins, a trumpetfish, a puffer fish, and a sea turtle getting scum cleaned off its shell by several hungry fish. Monday evening, we ate dinner in nearby Whalers' Village and I bought a little pineapple bracelet charm for my collection. Tuesday started windy and cloudy, so we drove to the Maui Ocean Center. 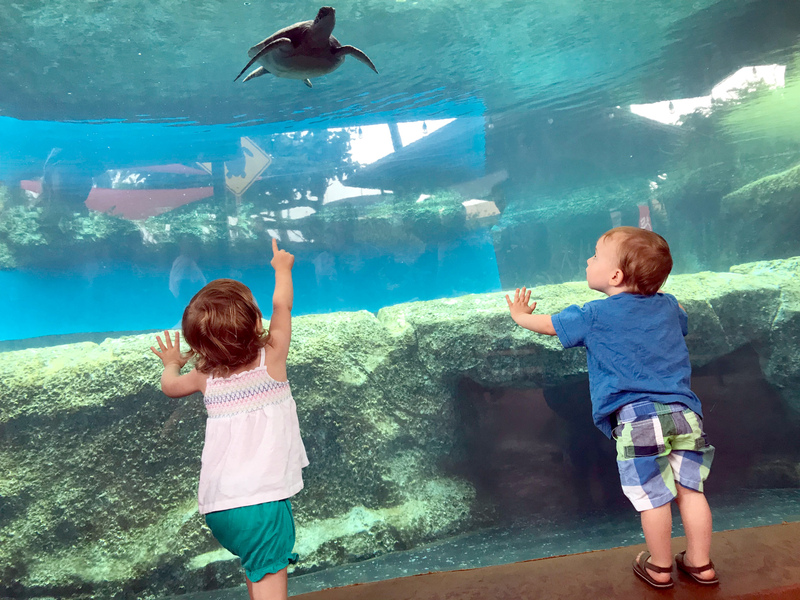 The kids loved seeing all the sea creatures, especially the turtles and fish! Tuesday evening, Mom and Dad watched the kids while Dan and I enjoyed a date-night dinner to ourselves! Wednesday morning, we went for a tour of the nearby Maui Dragonfruit Farm. The farm mainly grows dragonfruit (exotic looks, underwhelming taste) but also had papaya, pineapples, and different kinds of bananas. (Kelsey, our resident banana fanatic, was pretty excited). Our guide Richard, a Hawaiian native who has never left the islands, told us lots of interesting things about the farm and life in Hawaii. He showed us the different fruit plants and lifted the leaves of this big purple pod to show us the baby bananas inside. Wednesday evening, we went to the Royal Lahaina Luau. We all greatly enjoyed the show, but no one loved it as much as Mae. We told her it was a "Moana party," and she was completely enthralled with the "Moana dancing" and "fire circle," as she described the finale, a Samoan fire knife dance. The roast pork was fabulous, but we all agreed that poi must be an acquired taste. Thursday morning, we got on the road super early to complete an important right-of-passage for all visitors to Maui: The Road to Hana. The somewhat treacherous 64-mile-long stretch of road along the north east coast of Maui is peppered with innumerable hairpin turns and one-lane bridges. Hana itself isn't a particularly interesting destination, so the best parts of the drive are the panoramic ocean views, waterfalls, and interesting stops along the way. We followed the tips from Dad's GyPSy audio guide app and visited Ke'enae Arboretum, Wailua Falls, and the Pools of 'Ohe'o (also known as the 7 sacred pools, even though there are not 7 and they are not sacred). My favorite part of the trip was our stop at the black sand beaches in Wai'anapanapa State Park. The sand was fascinating... it looked like it would leave ashy stains on your hands but washed away clean just like regular sand. We walked through a small cave full of smooth black stones that led out to the ocean, and we climbed to the top of a rocky overlook to see the crashing waves. Everything about this place was beautiful. Despite our best efforts to make the trip quickly and only see the highlights, our Road to Hana adventure took about 11 hours. Dan had stayed at the resort to babysit Mae and Ollie, since long car trips aren't really his (or their) jam. We all agreed that Dan's ability to entertain two toddlers in a condo for an entire day definitely solidified his sainthood status. I especially liked the photos he sent of each kid inside their own blanket fort, Fort Ollie (no Maes allowed) and Fort Mae (an Ollie-free zone). On Friday, our last full day in Maui, we spent the day between the beach and pool. We enjoyed a nice dinner out and then came back to the beach to watch the sunset... a gorgeous end to the week. Saturday morning, we packed up and checked out of our hotel before heading into Lahaina to burn time before catching our flight. We ate lunch at Kimo's, the same restaurant my parents had visited during their trip 30 years ago. We caught the 10 p.m. red-eye to LAX, followed by another flight and a couple more hours in the car and finally arrived home at 9 p.m. the following day... exhausted but full of new memories and stories from a wonderful trip. Thank you, Mom and Dad!